And even though Jacob, had been severely injured, he still would not be denied: "I will not let you go unless you bless me." Now with the angel seeing that Jacob wasn't going to be deterred, he'd asked Jacob the question: "What is your name?" In the last couple of articles, we'd learned that Jacob had just come out of a difficult 20 year ordeal with his father-in-law Laban. And soon after the two had decided to part ways again, this time on good terms, we find that Jacob gains the privilege of receiving a visit from God's heavenly host of angels. Now the Sacred Record doesn't go into detail, when it comes to what the angels had said to Jacob during their visit. Would make it seem, that Jacob had received some bad news from the angels, when it came to his brother Esau. For he had learned, that his older twin brother Esau had settled from within the region, that he was now headed towards. And this particular region that Esau had settled in, was known as the land of Seir, which was also known as the country of Edom. Now the reason why I'm stating that this information would be "bad news" for Jacob? deals with the fact, that the last time Jacob had seen his brother, Esau had vowed to have him killed. And it would be, because of their turbulent history, that Jacob had became very afraid, when it came to meeting him. And remember, the reason why Esau was so angry with Jacob -- dealt with the fact, that Jacob, along with his mother -- had tricked their father into giving Jacob a special blessing, that was meant to go to Esau. And as far as we know, from up to this point -- Esau had never forgave Jacob, for what he had done. Nonetheless, this would turn out to be another unexpected ordeal, that is now taking place from within Jacob's life. And it would be for this reason, that Jacob would turn and pray to the Most High God for help. And it would be at this time, that he would ask the Lord, to protect him from his brother's wrath. And after Jacob had prayed to the Lord, next we find him, trying his best to do all that he could -- when it came to appeasing his brother. Understand that Jacob would do this, by sending Esau gifts, that in total, consisted of 550 animals. Jacob had done this, hoping that it would be good enough, when it came to garnering a peaceful meeting with his brother. Now after Jacob had sent his servants ahead with his gifts (or tribute) for Esau -- he decides later that night, to allow his family to follow out behind the party of servants, the ones that he had sent out earlier in the day. Now this family group that Jacob had sent, included: his two wives (Rachel & Leah), two maidservants (Bilhah & Zilpah - who are also his wives), and his 11 sons, along with his daughter Dinah. Jacob would help them to cross the river, that was known as the "Ford of Jabbok." So after they had crossed the river, Jacob would then send the rest of his possessions over to them -- while he decides, to spend the rest of the night, at the campsite all alone. Now it's presumed, that Jacob had continued to pray to the Most High -- when it came to asking for help, for most of the night. God Sends Jacob an Angel? And if this was, indeed the case? God would hear, and respond to Jacob's prayer, during that same night. For the Sacred Record would reveal, that God would respond to Jacob's prayer, by sending an angel down to personally meet with him. Now it's not clear what the angel had said to Jacob -- but one could presume, that Jacob wasn't satisfied with the message that the angel had brought? Understand that I'm making this statement, based on the fact, that when the angel had tried to leave -- Jacob would engage the angel, by not letting it go. And because of this, Jacob began to wrestle with the angel, again, while denying to let God's messenger go. For he'd refused to let the angel go, without receiving an answer from the Lord, that he would be satisfied with. 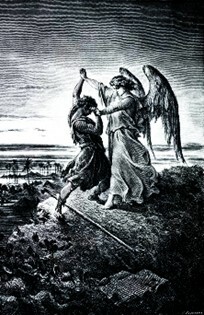 Now understand, that Jacob had wrestled with this angel for the rest of the night, and when daybreak had finally came, the angel suffered (yielded) himself, by not overpowering Jacob. Now it's at this point, that we should take notice of something? First off, know that there was no way that Jacob could have had overpowered a divine creature like this angel, especially one such as this? Also keep in mind, that this was simply a test that Jacob had to endure, for it was designed to strengthen his faith -- and to give him a new found hope, against the tremendous fear that he had, when it came to the thought of meeting his brother Esau after 20 years. So therefore, the angel allowed himself to be conquered. Now, what we should have noticed from within this passage? Deals with the fact, that with a single touch by the angel, Jacob's hip had been disabled. Understand, that this speaks of the true power and strength that the angel had possessed. And yet, in spite of this tremendous advantage, the angel asked Jacob: "Let me go, for it is daybreak." No I won't! - Not Until? Nonetheless, after the angel had blessed Jacob with a new name, Jacob wanted to know something about the angel? So he asked the angel: "Please tell me your name?" And after hearing this, the angel told Jacob as he departed: "Why do you ask my name?" Now notice how the angel didn't stick around to hear Jacob's response? For we must understand, that it did not matter what the angel name was -- for we remember, that Jacob had wrestled with him until daybreak for a "special blessing" from the Lord, and not for the unveiling of his name. And as the sun had rose above Jacob, he would limp off because of his disabled hip. Know that it's because of this great event, that the Israelites do not eat the sinew (tendon or muscle) attached to the socket of the animal's hip. Also understand, that this is not done because of superstitious thought or practice -- but it's done, to honor, and show appreciation for the tremendous test, that Jacob had to endure and pass, on that particular night. And it was because of this "test" -- that the Sacred Record would be able to reveal to us, the naming of a great nation that would be known from this point forward as Israel. Now personally, I find this to be a great example when it comes to having faith with boldness? For we must learn to wrestle (stay persistent) with God (if we have to), when it comes to our daily prayer life. And we shouldn't stop praying, until God answers us. And then guess what? We continue to stay persistent and pray some more -- this time thanking Him for what He'd just did, and for the things He will do for us, in the near future and beyond. So we just learned that Jacob was able to overcome the angel of the Lord. But will this be enough, to give him the confidence to finally face, and overcome his brother Esau? And when it comes to Esau's reaction? What will it be, when he finally reunite with the brother, that he had once, vowed to kill?